We hadn’t even arrived yet in the center, but we could already hear the Irish fans shouting out loudly. Although not really impressed by their draw against Sweden, I have to admit they did make quite an appearance in the streets of Bordeaux. All of us, eleven West-Flemish Belgians from the Westhoek region, tried our best to drown out the pack of boys-and-girls-in-green. Despite our best efforts, we soon realized we weren’t going to succeed on our own. And then there was magic: literally hundreds of Red Devils, Flemings and Walloons united, sharing beers and singing songs, just around the corner. One of my friends lit the fuse and yes indeed, the whole crowd joined us in shouting…. The tone was set, and as the Irish only could decide to accept defeat, we ended up mingling with the fans of our football opponent. That weekend, Belgium was going to face Ireland in Bordeaux, the capital of the newly formed French region Aquitaine-Limousin-Poitou-Charentes, near the Gironde estuary in the southwest of France. In the brand new Nouveau Stade Bordeaux, due to a commercial deal also known as the Matmut Atlantique, were 43,000 people. Belgium’s most famous sons were expected to deliver an unforgettable party, after their painful loss against the old-school Italian warriors. Eleven West-Flemish Belgian “Boys in Red” from the Westhoek region left family and work obligations to cheer on their Belgian national team in Bordeaux, France. Both red and green fans came together at the new Matmut Atlantique Stadium to witness Belgium win their match against Ireland, 3-0. Meanwhile back at the rented villa, barbecue and a refreshing swim awaited the “Boys in Red”. Thursday night, we had driven the entire trip to Bordeaux and finally found ourselves in the villa we rented. Although the skies were cloudy, it was most definitely hot. A swimming pool would have been more than welcome and as it happened, we found one kindly waiting for us right in our garden. Splash! 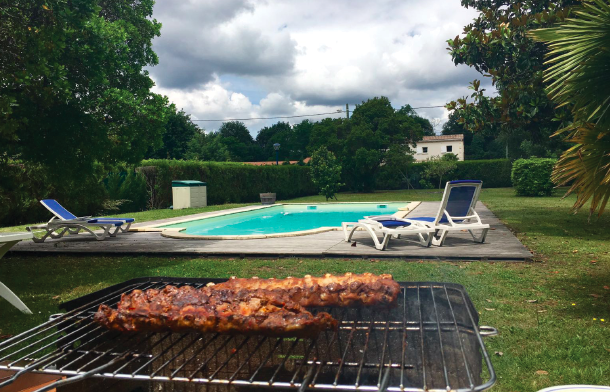 Our barbecue master for ages –thank you, Brecht! – lit the coal, mentally preparing us for a splendid greasy breakfast. 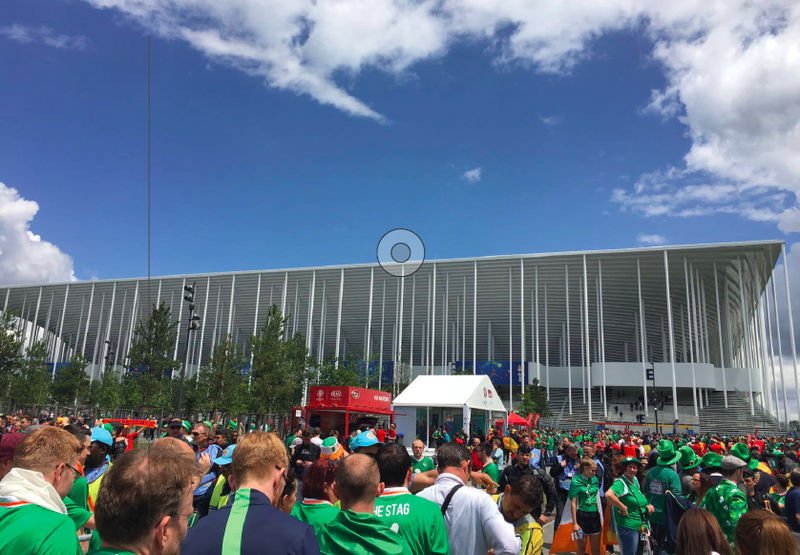 After chilling out on Friday afternoon and discovering Bordeaux by Night – and mingling with the Irish fans - the day that was to come promised to be one of a kind. Watching our already epic national soccer team (Courtois! Hazard! De Bruyne! Lukaku! Vermaelen!) live, playing at the European Championship Football, one of the biggest sports events of the year in the world, was a wonderful perspective. Another barbecue and loads of sangria, wine, beer (Belgian, of course) and cocktails later, we found ourselves in the perfect state of mind to cheer for our heroes. However there was a slight minor detail: only a lucky few had been able to purchase tickets for the game! Yours truly and six other Boys in Red had to watch the game in the fan zone, on the beautiful Esplanade des Quinconces in the very center of Bordeaux. A few years ago, I was at the exact same place with some of the same friends, to ride the epic bicycle tour Bordeaux-Paris, or 600 km in two days. Before you get impressed by my Merckxian talent, I reluctantly have to admit that I was the one driving the motorhome, supplying the guys with drinks and food throughout their two-wheel journey – important job though, right?! Back to the game, which Belgium clearly won with a 3-0 score. Twice Lukaku (that’s ‘Big Rom’ Romelu, not his brother Jordan who was also on the pitch) and once Axel Witsel, players of respectively Everton and Zenit Saint-Petersburg, contributing to the final score. The atmosphere was absolutely fantastic throughout the game – and we got interviewed by some Belgian media. That had probably to do with our very own mascot, the one and only lookalike of Radja Nainggolan, the Belgian pit bull playing for AS Roma. Dressed with a gigantic Belgian flag around his shoulders and a tricolore mohawk, Nainggolan’s characteristic haircut, our jolly Roman soldier Joachim was the star of our team. A hangover, some aspirins and indeed, a barbecue later, we tried to greet the Belgian squad, as their hotel was not for away from our villa. Some of us managed to get a glimpse of the players when the team bus drove to the training pitch, but unfortunately the day-after training was not open to the public. Going back to our swimming pool was not the worst decision we had to make, and we enjoyed a lazy Sunday afternoon, ready to leave again northward, back home. A special thanks to my friends for yet another unforgettable journey together, but also to our Dutch (!) neighbor and his wife, who were so kind to drive us around to the center of Bordeaux and back to our villa at impossible times, when people should be sleeping. Merci! * unfortunately Wales defeated the Red Devils 3-1 in the quarterfinals.